The Grow Solar team has reached out to communities, three of which have confirmed to be a Growing Solar Community in the Grow Solar Partnership. Wisconsin participation thus far is diverse in both geography and by type of government, including a range of cities, but also a county, town, and village (representing all types of statutory local governments). 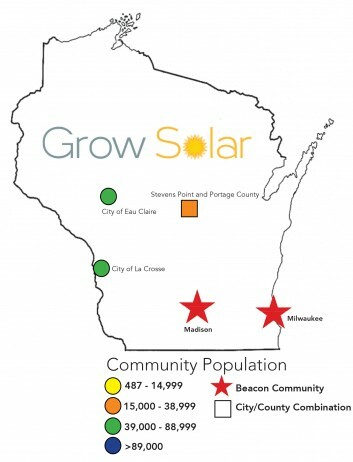 The Grow Solar Team has identified additional potential opportunities for participation by suburban communities around Wisconsin’s two Beacon cities. In addition to Growing Solar Communities, Wisconsin outreach has connected with organizations that have trusted relationships with cities and local governments, including the Wisconsin League of Municipalities, Wisconsin Energy Independent Communities, and regional governments such as the Southwest Wisconsin Regional Planning Commission.